The Moon often represents your ‘shadow’ self. The shadow is a psychological term introduced by the late Swiss psychiatrist Dr. Carl G. Jung, and is a part of the unconscious mind consisting of repressed weaknesses, shortcomings and instincts. “Everyone carries a shadow,” Jung wrote, “and the less it is embodied in the individual’s conscious life, the blacker and denser it is” (cited in http://en.wikipedia.org/wiki/Shadow_%28psychology%29). According to Jung, the shadow, in being instinctive and irrational, is prone to projection, turning a personal inferiority into a perceived moral deficiency in someone else. Thus the Moon calls your attention to your shadow, becoming consciously aware of any tendencies to project fear and anxiety onto your external surroundings, and turning it around into more positive and constructive energy. 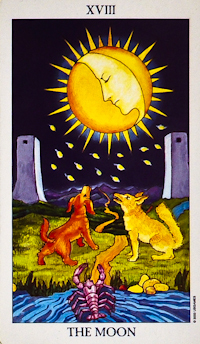 The Moon is a psychological card of projecting fear into your present and your future, based on past experiences. The images, thoughts and feelings that you have repressed over time cause inner disturbances that are becoming overwhelming. As a result, you are now experiencing negative blocks within your personality, causing fear and anxiety. To remedy this, you need to go through a purging process whereby deep memories are released. This is a time when you need to go deep into your soul and dredge up your anxieties, fears, psychic blocks and personality disturbances. Many invisible things are coming to the surface including secret motives, clandestine information and ancient hidden truths. These newly discovered resources may confuse you but once they are brought to your awareness, they will no longer haunt you. The Moon is a card of illusion and deception, and therefore often suggests a time when something is not as it appears to be. Vigilance and clear perception will be necessary to find that which is hidden before it is too late. If other cards in the reading are negative, then the Moon shows that not all is as wonderful as you would think and there are still hidden forces at play that may unravel your success. You may be idealising the situation, and ignoring the fact that potential for failure exists among success. If the other cards are generally positive, then the Moon suggests that you are letting your imagination run away with you, and that things are not nearly as bad as they seem. In both cases you must open your eyes and see what it really going on. Guard against accepting illusions as they may cause an error in your judgment. Oftentimes, the Moon appears in a reading when you are not sure of your destination, or even of the path you are traveling but you travel nonetheless. You may have lost your way and are now left to walk in the dark, guided only by your inner light and intuition. You need to go on without a clear picture of where you are, where you are going or where you have been. The Moon is a card of intuition and psychic forces, so let go of your conscious mental blocks or negative self-talk, and allow your intuition to guide you. Your dreams, intuitions, and inner promptings lead you forward toward higher levels of understanding if you listen carefully and use your judgment to help interpret the veiled messages of the unconscious. Not only will the way forward be revealed but in many cases you will learn lessons about yourself that will be valuable in later journeys. The King of Cups sits on his throne on a grey stone block, calmly in the midst of a turbulent sea and wears a necklace with a fish amulet. The fish is the symbol of spirit and creativity and represents the balance of the unconscious with the conscious. Behind him on his right, another fish jumps wildly from the tumultuous ocean, and, on his left, a ship sails steadily in the choppy ocean. These images are a sign that the unconscious has been allowed to break through and has been recognised by the King, yet it remains within his power and does not overwhelm him. The King of Cups does not repress his emotions and unconscious impulses but has learned to accept and deal with them in a mature and balanced manner. The King of Cups, like all the court cards in the suit of Cups, represents emotion, creativity, and the unconscious. Unlike the preceding three court cards, however, the King of Cups expresses much more restraint in his emotional state. He is a master of his own feelings, and remains in control of his emotions. Not to say that he represses those feelings and sentiments. On the contrary, the King of Cups represents the balance between the emotions and the intellect. He is a master of compassion and kindness and his card often indicates strong bonds in a relationship based on temperance and understanding. As such, the King of Cups indicates that you feel very emotionally balanced and in control. You have a very deep understanding of your feelings and emotions, and are able to connect with this when necessary. As you deal with some of the scenarios that life throws at you, draw on this deep emotional maturity to help you navigate these challenges. Also, know that this is an incredible gift you have and be open to sharing your emotional stability and calm approach with others. The King of Cups encourages you to be considerate in your dealings with others and as you counsel others. You may need to understand why strong feelings have surfaced and how to best cope with them. It is important that you do not repress emotions but instead explore them with an open heart and an open mind. Sometimes, the King of Cups can represent an older male who may appear in your life. This card represents a man of business, law or divinity, who is kind, considerate and willing to take responsibility for his actions. He is paternalistic but in a sensitive, generous manner, and he enjoys the quiet power associated with providing loving energy to others. He is able to listen mindfully to others and he responds calmly in a crisis. He uses diplomacy rather than force, and reached out to help, not to stifle or have it only his way! 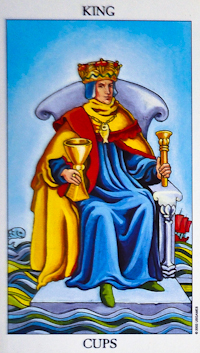 Similarly, the King of Cups shows you generosity, graciousness, love, calmness, caring and will give you his healing ways. He has power in the business world and loves law and order. You would love him to be your doctor. If there were a crisis at hand, this is someone you would hope to have near. The King of Cups is highly diplomatic and politically correct. He has a real talent at being able to balance the needs of many people and keeps everyone working together harmoniously and productively. He knows how to show care and sensitivity as he leads others towards a common goal. He responds carefully to others’ emotional needs and can diffuse a tense situation by reading and responding to the different people involved. If you are being challenged personally, the King of Cups suggests you will need to remain emotionally mature in dealing with the negative energy from others. You need to be clear in your own mind about what your boundaries are and what is and is not acceptable on an emotional level. This King is level-headed and in control of his emotions. He uses his emotional intellect to make smart decisions and does not let other circumstances or whims sway him from his central belief system and his morals. On the Six of Cups, there are six cups filled with white, five-pointed flowers. A young boy seems to smell one flower, offering this filled cup to another young child. The small child symbolizes the past and the taller child symbolizes the future, and together they symbolize happy reunions with past friends or lovers. They share old pleasures with lots of nostalgia. In the background, there is an older figure walking away, symbolizing our worries leaving us to be locked in the turret. The house symbolizes comfort and security but the barren garden symbolizes the lost happier times of the past. Everything is bright yellow which indicates great happiness in this overall scene. The Six of Cups is a card of childhood, nostalgia, naïve happiness, and generosity. You want to return to the happy memories of your past, whether as a child, teenager or adult. Oftentimes, though, these memories are indeed a thing of the past and reflect aspects of your life that have since vanished. You may feel that the only way to connect to this happiness is to escape into the past where you can reflect on your happy and beautiful memories, instead of dealing with current challenges. This is fine if you are simply taking a walk down memory lane but it is important that you live in the present and accept your current circumstances rather than always living in the past. Oftentimes, there is nothing wrong with looking back at the good times for inspiration when things are not going so well. In the midst of change and crisis, the Six of Cups suggests that looking back at what you have endured is a good way to assure yourself that, whatever trials lay ahead, you will meet them and you will overcome them as you overcame others. After losses such as those on the Fives, the Six of Cups suggests that you need to take time out to heal, look back on the past and all the good that lies there. During this period of reflection, there is no need to focus on the negative. Instead, bring all of the positive energy from the past into your present and your future. The fallen cups are now full and upright again but with blooming flowers that cannot be spilled or washed away. Now that you have looked back, the way forward will be clear and enlightening. The Six of Cups can represent a return to a familiar environment or to a childhood place. You may return to your home town, to your parents’ house, to your high school or even kindergarten. You could be going to a high school reunion or reconnecting with a childhood acquaintance. A teenage sweetheart or past lover may turn up again. Allow yourself positive, nostalgic memories of childhood, friends and family. If you can, spend time with younger people. 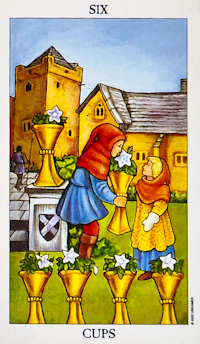 The Six of Cups can also point to your inner child and suggests a need to experience child-like joy. The child you were still lives within you and must be cared for. This is often referred to as working with your inner child. People with persistent problems such as addiction, depression, troubled relationships and chronic dissatisfaction can transform their lives with inner child work and find a new joy and energy in living. The source of your problems may be in past events that are triggered in the present. We are made up of many parts and inside we still have the little child and adolescent we were with all of its experiences and feelings. This can lead to the inner child reacting strongly to certain experiences, situations and feelings in the present, based on experiences of the past. Working with your inner child and getting to know where these feelings come from can change that and enhance your choices in miraculous ways. When we are being playful, spontaneous, creative, intuitive and surrendering to the spiritual self, our genuine authentic Self, who we know deep within us, our real Self is being welcomed and encouraged to be present. The Six of Cups can also refer to children in your life. It can denote a pregnancy, birth or adoption, depending on the other cards in the reading. Or, it may indicate that you are about to spend more time with young children, playing, laughing and learning together. Children play a significant role in your present life, and can serve as great advisers. Children are good role models to follow when this card is present. They see the world as a completely perfect place and their hearts are open to experience the myriad pleasures of the world around them. The Six of Cups almost radiates an aura of joy, because it represents the past with all its memories, the present with all its gifts, and the future with all its wondrous opportunities. The Six of Cups can thus signal a gift given or received, or some other similar gesture. You may be inspired to act kindly or charitably, or to do a good turn for another person. You are more open to sharing what you have and being well-intentioned. Honesty and fairness are the two qualities that make Scorpio a great friend. 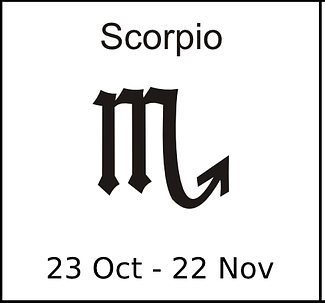 People born under the Scorpio sign are very dedicated and loyal, when it comes to working. They are quick-witted and intelligent, so they would feel better to be in the company of witty and fun loving people. They are full of surprises and will give you everything you need, but if you let them down once – there’s no return. Scorpios are very emotional, when they are in pain, it is simply impossible to make them feel better. They are very dedicated and they take good care of their family. Scorpios are fantastic in management, solving and creating. When a Scorpio sets a goal, there is no giving up. Scorpios are great in solving tasks that require a scientific and thorough approach. Their ability to focus with determination makes them very capable managers. They never mix business with friendship. Jobs such as a scientist, physician, researcher, sailor, detective, cop, business manager and psychologist are appropriate for this powerful zodiac sign. Scorpio respects other people, so expects to be respected in return. Scorpios are disciplined enough to stick to the budget, but they are also not afraid of hard work to bring themselves in a better financial position. However, they are not inclined to spend much. Money means security and a sense of control for them, which means that they are good at saving money and make decisions carefully before investing in something.